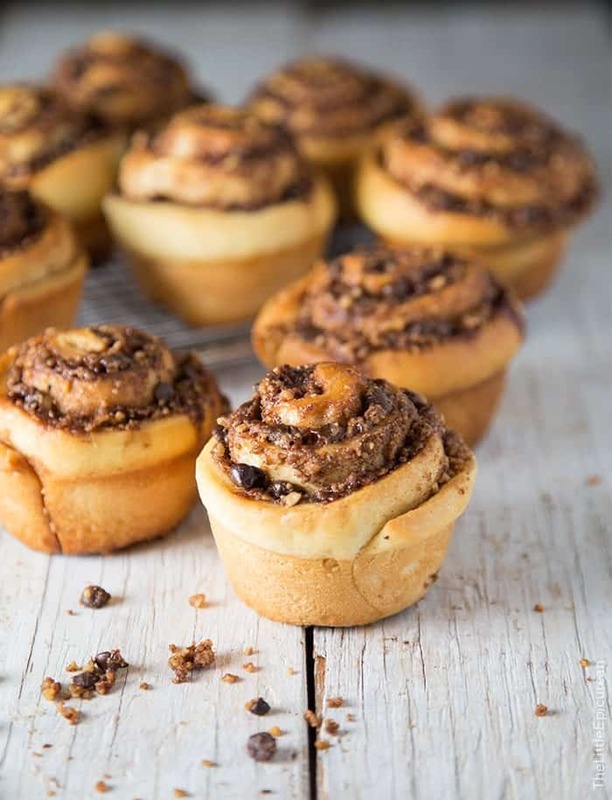 These chocolate walnut cinnamon rolls are baked in a muffin tin for easy portioning. 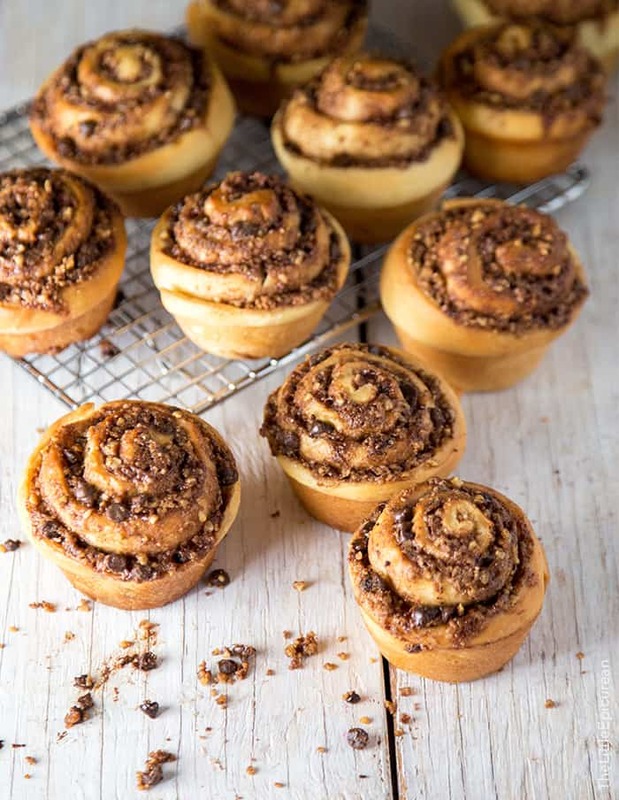 Since these rolls are packed with so much flavor from the chocolate walnut filling, any additional icing or glaze is unnecessary. I add a dash of ground cinnamon to my morning coffee. I like to steep cinnamon in my almond milk. A pinch of cinnamon is required in all my oatmeals. And obviously my favorite sugary cereal as a child was Cinnamon Toast Crunch. Here’s a sweet baked good for those that are not too keen on cinnamon. The addition of bittersweet chocolate slightly mutes the iconic cinnamon notes. Instead, you’re simply left with the warm inviting aroma of cinnamon. Rather than bake these chocolate walnut cinnamon rolls in a large baking dish, I opted to bake them individually. Muffin tins. They’re not just for muffins. You can use it to bake brownies, cheesecakes, cookies, even baked eggs. And my new favorite thing to make in muffin tins- sticky buns and cinnamon rolls! The tin portions everything equally. The cinnamon rolls don’t go spreading all over the place. And there’s absolutely no mess when trying to divide and serve the baked cinnamon rolls. Once baked, the chocolate walnut cinnamon rolls end up looking like muffins/popovers/snail brioche rolls. The best part of these cinnamon rolls are the little pockets of melted chocolate throughout the dough. The filling provides enough sweetness and flavor, making any icing or glaze unnecessary. Although, an iced latte, cup of coffee, or glass of milk would be very much welcome. The cinnamon flavor is subtle, but you can definitely smell it when it’s baking. These rolls are best served warm. If you happen to have leftovers, just pop them in the microwave with a cup of water for about 45 seconds. The will help to ensure that the bread doesn’t get all chewy and rubbery. This trick also works for reheating any breads in the microwave. Sprinkle yeast over warm water. Add 1 tsp sugar and stir to combine. Let sit for 5-7 minutes to allow mixture to bubble and activate. In the bowl of a stand mixer, add dissolved yeast mixture, milk, remaining sugar, salt and egg. Once combined, add 1 cup of flour. Use the hook attachment to mix together. Add another cup of flour, follow with coconut oil. Add last cup of flour. Knead until dough is smooth and cleans the sides of the bowl. If dough is too sticky, add flour 1 Tbsp at a time until desired consistency is achieved. Transfer dough to a lightly greased bowl. Cover bowl with plastic wrap and let dough rest at room temperature for 60 minutes. Chocolate Walnut Filling: Meanwhile, combine softened butter and vanilla paste. Stir together. It should resemble the consistency of mayonnaise. Set aside. In a small bowl, mix together ground walnuts, sugar, cocoa powder, cinnamon and salt. Set aside. Transfer dough to a lightly floured working surface. Roll dough into a 18 x 12-inch rectangle. Spread softened vanilla butter over dough, leaving a 1/4-inch border around all sides. Sprinkle ground walnut mixture over butter. Top with mini chocolate chips. Gently press filling into dough. Roll dough into a tight log, starting with the long side. Slice log into 12 equal slices. Place cut slices into a lightly greased muffin tin. Cover with plastic wrap and let roll rest for 30-45 minutes at room temperature. Preheat oven to 350 degrees F. Remove plastic wrap and bake rolls for 28-30 minutes until golden brown and internal temperature of rolls hit 185 degrees F. Let rolls sit in pan for 5 minutes before unmolding. Serve warm. These rolls are best served warm. If you happen to have leftovers, just pop them in the microwave with a cup of water for about 45 seconds. The will help to ensure that the bread doesn't get all chewy and rubbery. These are fabulous, Maryanne. I love to make rolls in muffin tins. And all that cinnamon-y goodness has my mouth watering this morning. Maryanne, I love that you made these in a muffin pan!! Genius! Thanks Alice! I love finding new ways to use kitchen gadgets! They need to have more than one purpose to have a place in my tiny kitchen! Though I look the messy ‘all-in-one-tray’ rolls, I do loved your muffin tin ones ;) And I really liked the combination of flavours in the filling, and how good that your Mom liked them ahah ;) I can’t believe your brother falls for your tricks – I don’t think I could pull it! Oh yum! I totally get you on the non-genetic food tastes! I love sweet potato and my Mum can’t stand it! But we both have an aversion to mayonnaise – the texture – ugh! 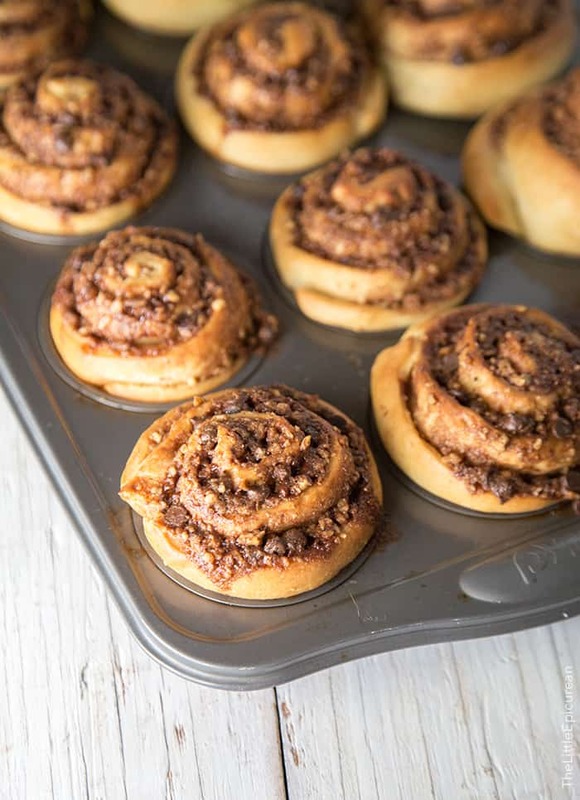 These cinnamon rolls however would be a favourite with everyone in our family! Now I just need to get adventurous with my baking and make a gluten free version of your gorgeous rolls! I can’t wait for the cinnamon-y, chocolaty, walnutty, goodness! Thans Allie! I’m so honored and flattered to be among such great company! Congrats to you as well! 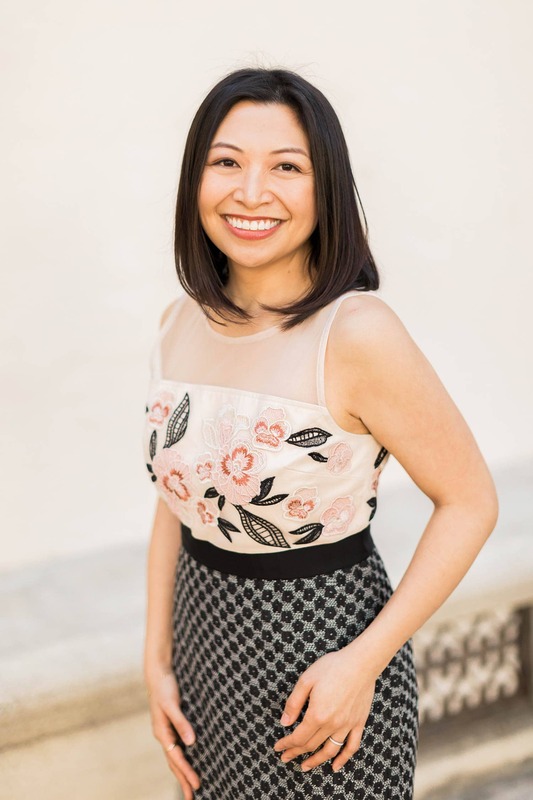 ;) It’s past midnight but I’m suddenly craving dessert after seeing your peanut butter tagalong cupcakes… YUM! Maryanne these cinnamon rolls are perfect! 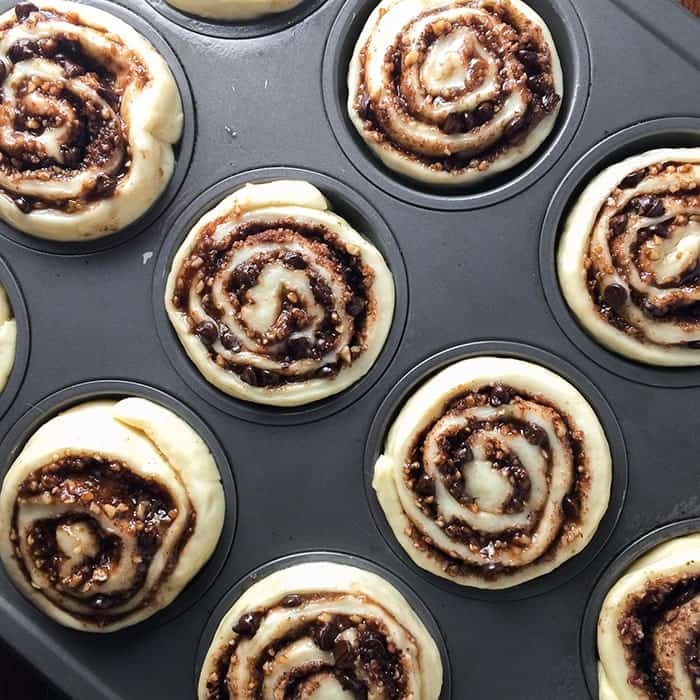 I love making cinnamon rolls but never have baked them in individual muffin tins before.. so next time I make some i will be following this recipe! I’m all for well-meaning trickery when facing picky eaters. I can’t believe your mom doesn’t like cinnamon! The cinnamon in these roll is exactly what’s MAKING me drool. I feel like I can smell them through the screen. Hi there! Is there any way of incorporating nutella into this instead of choc chips? I love the muffin tin idea!!! What can be used in place of coconut oil? Family member with an allergy to coconut! You can use equal amount of softened butter.